LONDON - Marco Ariello, previously Chair of the iconic notebook company Moleskine, was named Chairman of Datamaran Ltd., a London-based technology business that provides unique software solutions for non-financial risk management. 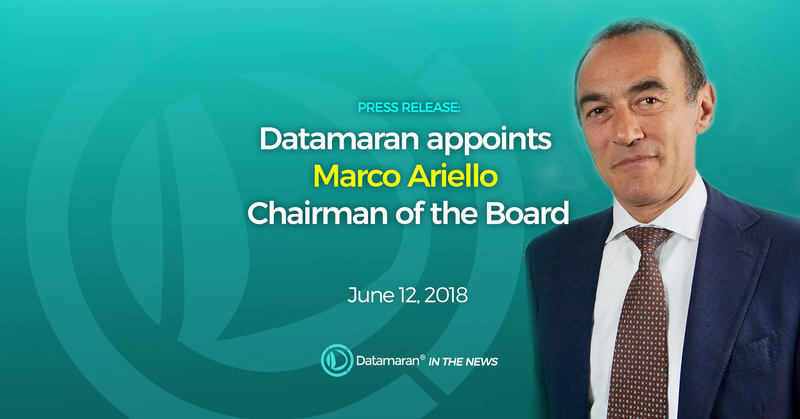 Marco Ariello’s appointment comes after Datamaran, which also has offices in Spain and the US, closed its Series-A financing round and is focusing on large-scale distribution of its AI platform. Marco has a proven track record in building globally recognized brands and scaling businesses, as well as a wealth of experience in private equity. Over the past 4 years, Datamaran’s fast-growing client-base of multinationals have replaced the dated and expensive manual processes they previously used for benchmarking and risk analysis. Datamaran has brought together a team of veteran industry ESG experts, risk management experts and data science and technology professionals while building a proprietary software that enhances data-driven decision-making. Datamaran is a must-have business process for companies that need to identify and monitor emerging ESG risks. "Datamaran provides us with a fact-based approach and helps us to automatically screen various stakeholder groups, such as peers, regulators and NGOs with one single tool", says Dr Brigitte Dittrich-Kraemer, Senior Sustainability Manager at BASF, "Datamaran offers a great way to learn more about our stakeholders' expectations." Marco Ariello succeeds Helle Bank Jørgensen, who will be transitioning to a strategic advisory role within the company. “It has been rewarding to contribute to Datamaran’s growth. It is now time for a new Chairman to bring the company further. I'm very pleased with his appointment and I'm looking forward to continuing to support and work with the team,” commented Helle Bank Jørgensen. Accordingly, Datamaran will enlarge its position in the global GRC (governance, risk and compliance) market with a specific focus on North-America and Europe. Datamaran’s AI platform will continue to benefit from innovations – with solutions tailored for clients at any maturity level. Datamaran is the global leader in Software as a Service (SaaS) solutions for non-financial risk management. The team is composed of veteran industry ESG experts, risk management experts and data science and technology professionals. Datamaran’s proprietary software enhances data-driven decision-making. The company captures evidence-based insights for more than 7,000 companies worldwide. Datamaran’s AI sifts and analyses extensive publicly available sources such as corporate reporting, regulations, news and social media. Datamaran’s global clientele of multinationals have replaced the dated and expensive manual processes they used for benchmarking, materiality analysis, risk analysis and issues monitoring. The insights customers gather are used across multiple business teams (governance, risk, compliance, sustainability) to identify and monitor risks and opportunities and inform corporate strategy. Datamaran is a well-known and trusted partner of established advisory firms that use Datamaran to augment their consulting offerings.